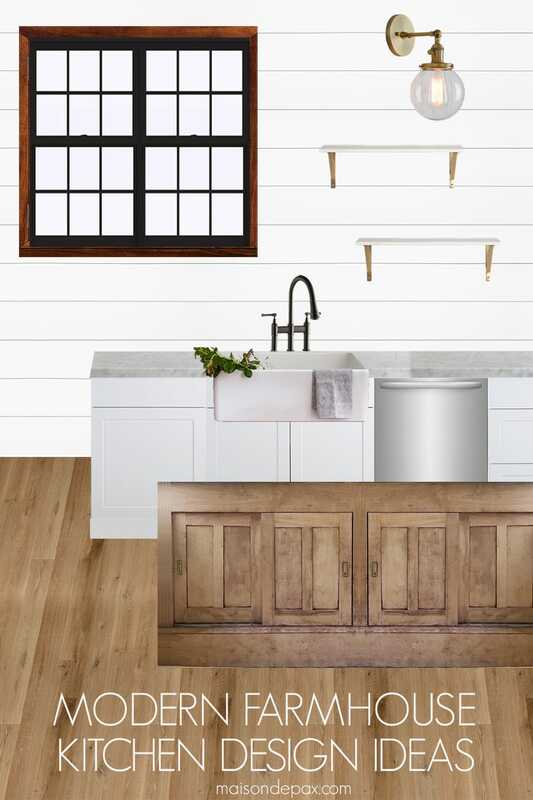 Modern farmhouse kitchen design ideas: see before pictures and plans for a rustic modern kitchen makeover. One of my superpowers is the ability to memorize just about any song lyrics I’ve ever heard and to regurgitate them even years later. My kryptonite, so to speak, is the inability to get a song out of my head once it starts playing… And “She’s gone country” is currently driving me mad. But if you saw our announcement on Instagram, you know why! 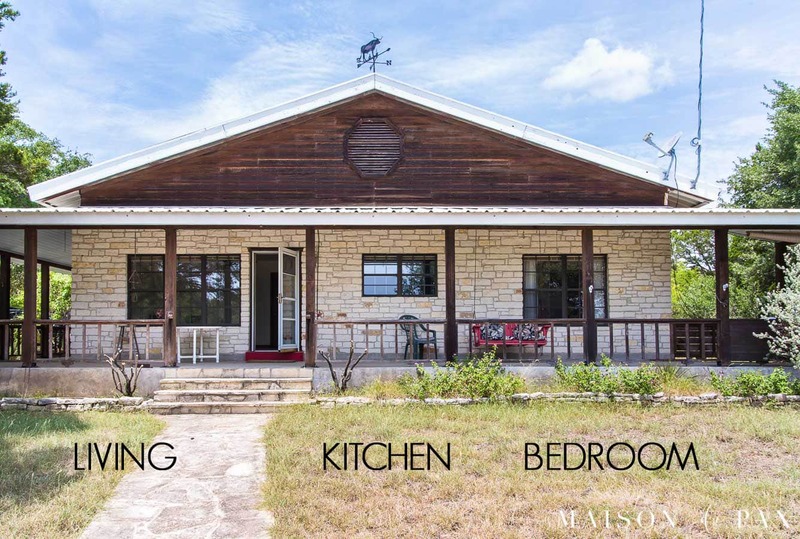 We’ve bit the bullet and purchased a little house on six-ish acres out in the Texas hill country, and we couldn’t be more excited. 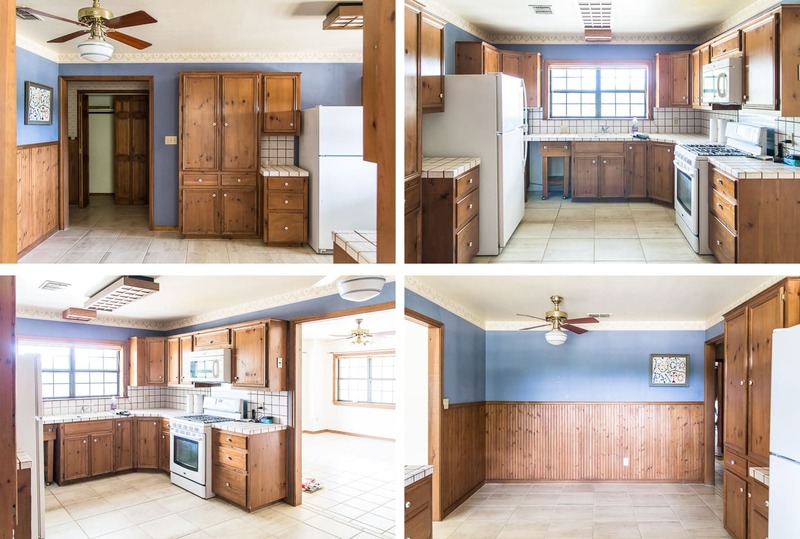 It needs a little makeover, and we’ve decided to start with the kitchen. 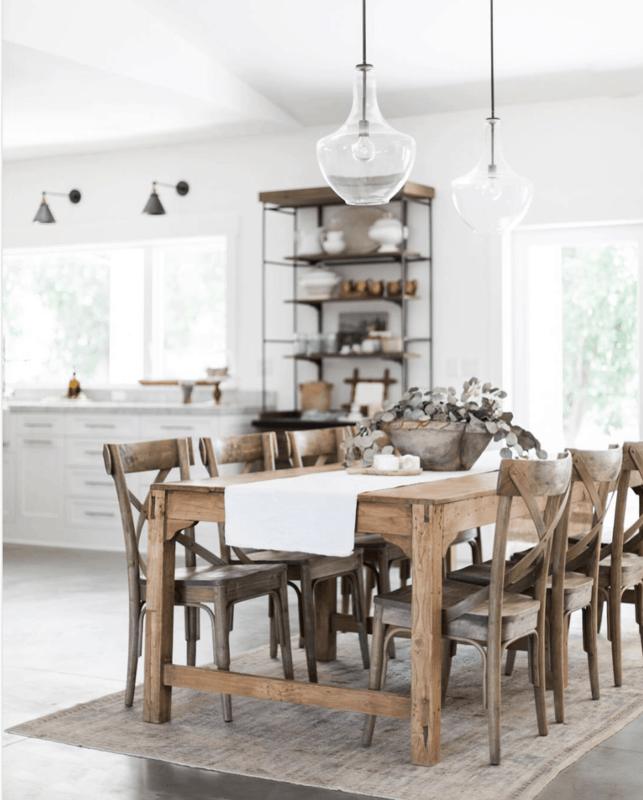 We’re dreaming of a rustic, modern farmhouse look: something infinitely functional and yet authentic feeling to the little country home. Most of all, we want it to be oozing with comfort and charm – inviting all to enter and relax. Of course, before we can talk design plans, you’ve got to know what we’re working with! So here’s the rundown on the current kitchen. There is an amazing porch that runs the full length of the front of the house. 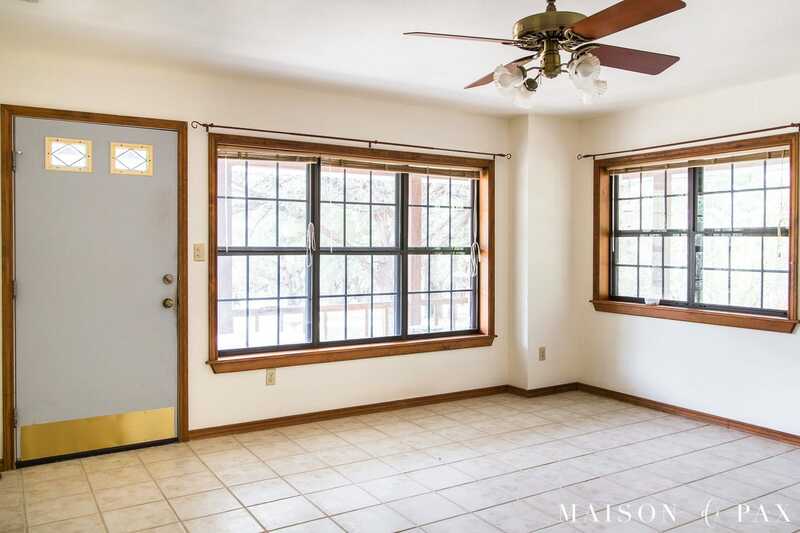 And when looking at that front porch, the front door leads into the living room on the left; the kitchen is in the middle with that smaller window; and there is a bedroom on the right. As you can see, the current kitchen doesn’t allow for much gathering. And the sole living space you see through that doorway in the kitchen is on the small side for a family of our size (not to mention the extended family and friends we hope to bring together here!). So the plan is to remove the walls on either side of the kitchen, opening up the full front of the house to be a living/kitchen/dining combo. 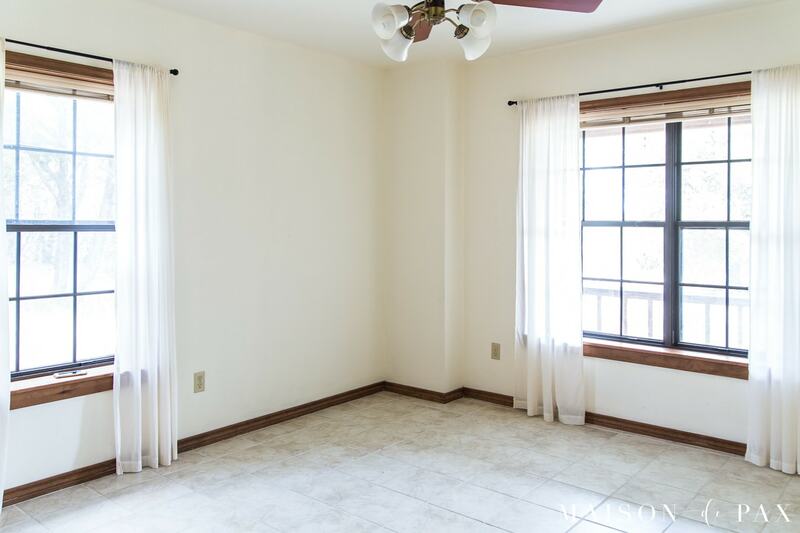 And yes, that means that we will be turning that bedroom into the dining room, but can’t you just see this space as a dining room? I’ve got detailed drawings and all sorts of specifics I’m working on right now, but I thought for today it would just be fun to see the general ideas I’m chasing. Here are some aspects I’m hoping to integrate into this new living/kitchen/dining space. Quick note: as always, when I share others’ work on this blog, I hope you will click over, visit these incredibly talented designers, and follow them! If you do love some of these images and would like to save them on Pinterest, please click through and pin from the original source. Thanks! We have wide plank white oak floors in our current home, and we love them. 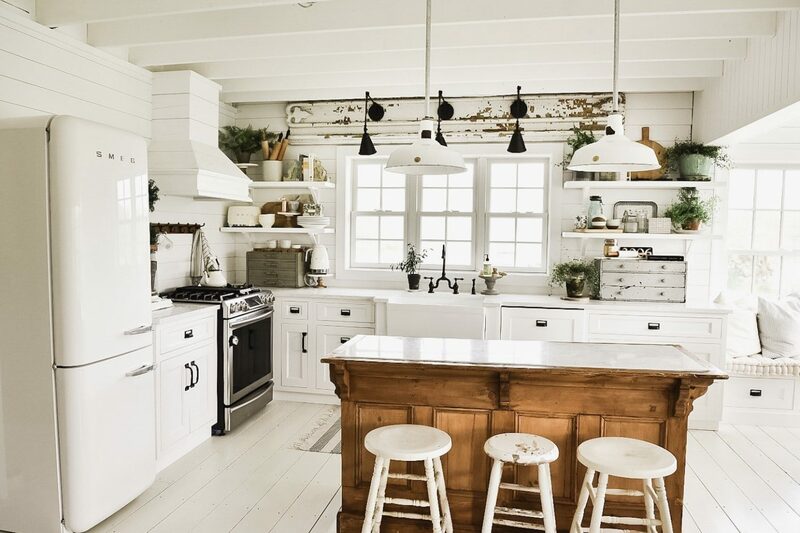 But a lighter color, like The Ranch Uncommon has in her kitchen is simply perfect for the simple, white-and-wood rustic look. Though I haven’t decided on my backsplash material yet, I knew from the start that I wanted to capitalize on our black windows that are already there and have no upper cabinets at all. 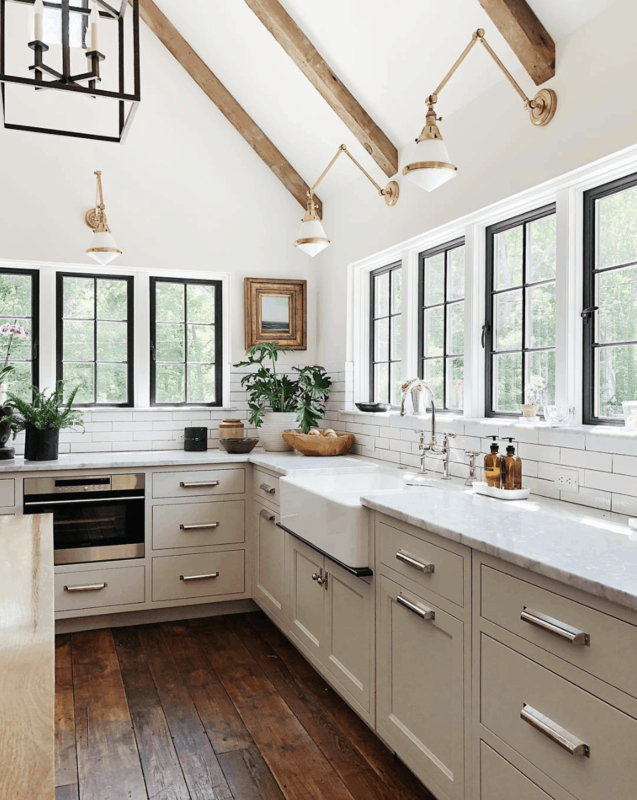 We may incorporate an open shelf or two, but mostly I want light, white, open space above the countertops to draw the eye out those beautiful black windows and into the woods beyond. This incredible space by Jean Stoffer Design confirmed my inclination! Once we remove the walls, we’ll be adding a giant island to the middle of the long rectangle. The sink will stay where it is below the window, and the stove will face it in the island. I know it’s not technically a galley kitchen by any means, but the functional portions of the kitchen will be similar to a galley since we will basically be incorporating our fridge, sink, and stove – as well as all our cabinetry – in two lines facing each other: the sink wall and the island. This view of a gorgeous space by Jaclyn Peters Design has a similar balancing act between those two counters. Although we intend to have fully modern, functioning cabinetry on the “working” side of the island, I want to encase the other three sides – the parts that face the majority of the living space – with a rustic, raw wood look. 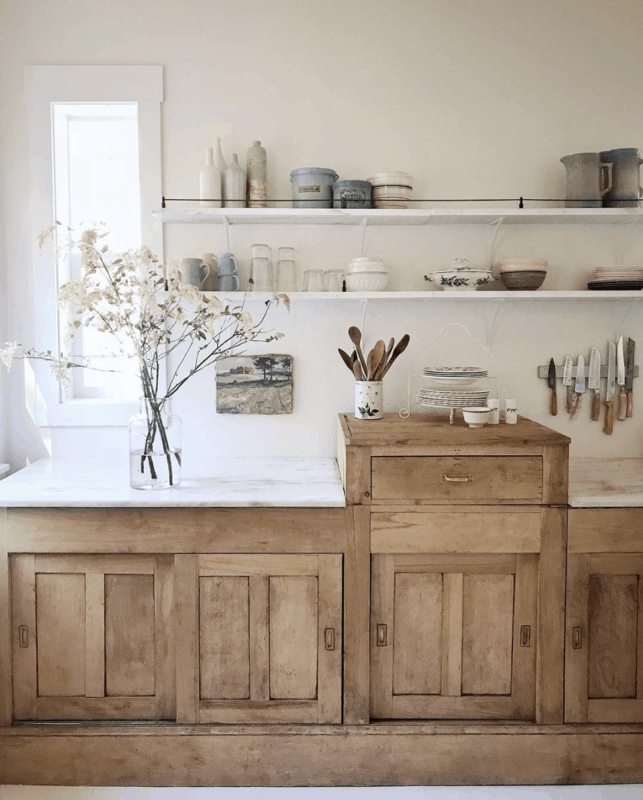 The gorgeous antique general store counter that Liz Marie has in her kitchen is just the right complement to the white cabinetry. Speaking of the island, with a family of six (and hopefully lots of visitors! ), we’ll need a few more seats. 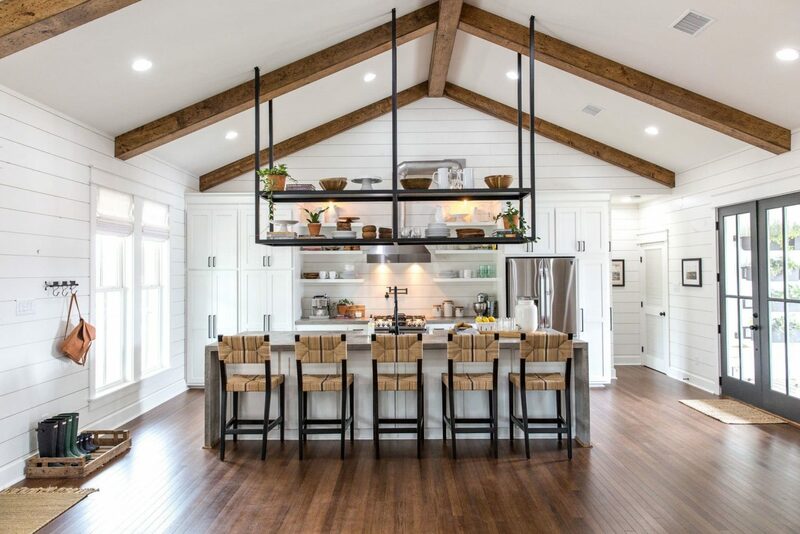 We are currently planning a 10′ island, so I think the overall layout of this incredible kitchen by Joanna Gaines is probably more similar to what we’ll end up with: a huge island facing a single wall of cabinetry. In order to maximize storage (because, as I mentioned, we will only have the lower cabinets under the window and the island itself), I want to have cabinets under the island bar. Sliding doors like the ones in this antique cabinet in the gorgeous kitchen of The Market Beautiful would be the perfect way to have storage under the bar without banging into the bar stools. I have this firm belief that the architecture and style of a home should play a role in the design of the interior, so my last two very traditional homes have limited my rustic inclinations… but this property and home are simply begging for it. I want to include some elegant details and some unexpected modern touches, but mostly I just want it to feel comfortable and inviting. 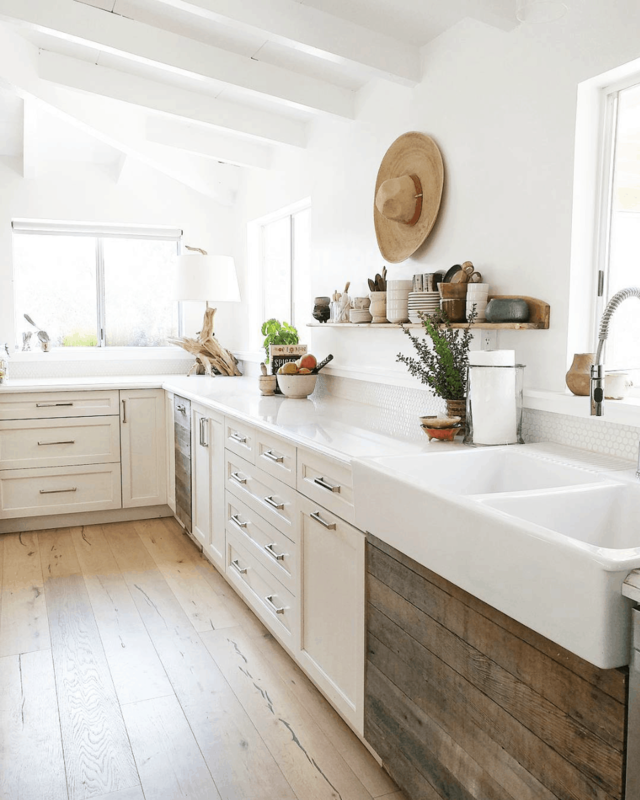 And this sweet space from White Flower Farmhouse embodies that beautifully: the warm wood tones, the classic white cabinetry, the marble countertops, the rustic floors… we are so excited about a home that calls for that kind of charm. While I’m far from having furniture picked out for the space, this is a non-negotiable for me: I want a large dining table that simply begs everyone to gather round. And this space from Heather Bullard which opens right onto her gorgeous kitchen has exactly the feel I want to achieve. So as I mentioned, please go follow these incredibly talented designers… and tell me, what’s your favorite part of our plans so far? And for sources I’ve used in my inspiration mood board, see below. This list contains affiliate links. Click here to read my full disclosure. I am a newbie to your blog and I am so happy that I found you! I love your style. I am wanting to change my dining room hutch from stained to painted. What type of paint would you recommend that I use. Since I have never painted furniture before, I am considering hiring it done. I want to use paint that will be durable. Thanks so much for your time and expertise. Hi Cheryl, Chalk paint is very easy to apply (no primer) and is durable. 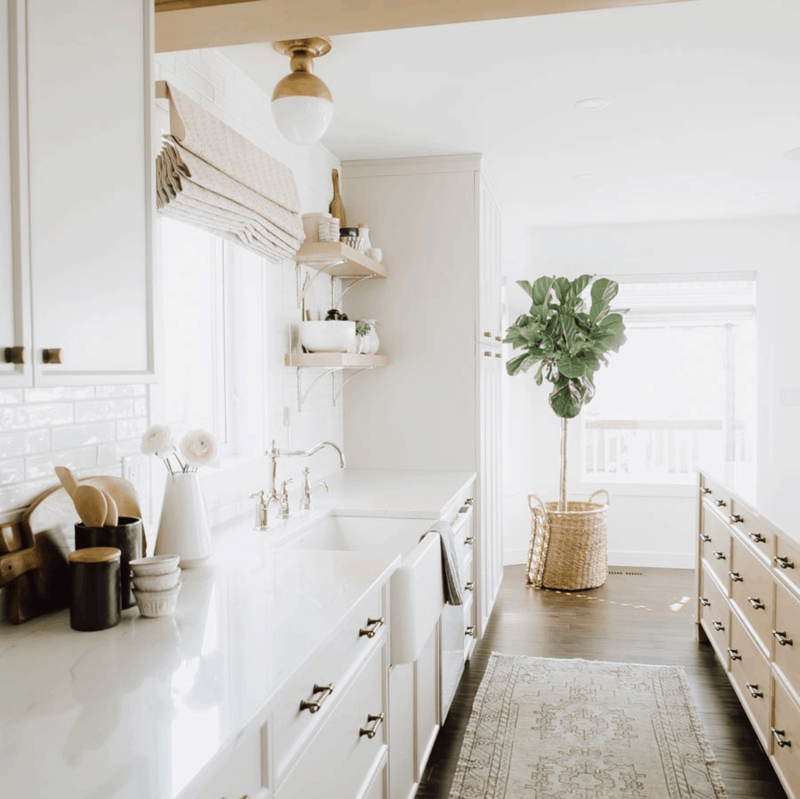 You can expect a few areas that might chip over time, but if you like the vintage look, then that might be ok. For a modern, sleek loop, a primer and paint like Benjamin Moore Advanced Paint is designed for cabinets and lasts a long time. Chipping is inevitable, so I like to keep a small baby food container to touch up annually. Rachel, Thanks so much for the Benjamin Moore Advanced Paint idea. I am definitely going for a sleek, more modern look. I have never heard of the BM Advanced Paint. I will definitely check it out. Your idea of keeping a small baby food container of paint for chipping is a good one. I am going to do that for my white kitchen cabinets. My best to you. Hope you are feeling better. 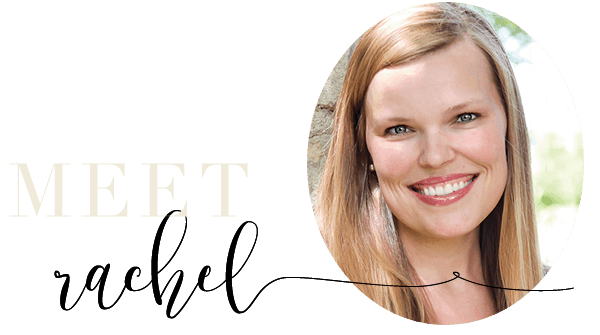 Rachel, I am so HAPPY for you and the family. I LOVE the property and the house. I am like you in the sense that just thinking about design makes me excited. I can envision your plans clearly. And, like you I hate when a song gets trapped in my head because I have to make a conscious effort to stop it. I often try to find something else to sing, lol. It does eventually stop for a while. Haha, Juanita! It can be a real struggle to get the song out! Thanks for stopping by! Here we go again, i am so glad to have been with you a while or i would have missed all these posts on redoing kitchens. I am really liking your ideas and love this farmhouse you have found. Have a great weekend. Thank you for being a regular reader, Marlene! Hi, love your ideas. I don’t do instagram ( and don’t intend to), so I feel like I am missing out. Good luck with your kitchen reno. I look forward to watching your progress. Your plans look great. Are you moving to this new house, or will this be a second house for your family? Wow, this is all so beautiful, Rachel!! I love your vision for this home. Looking forward to following along as you remodel. I’m sure you’ll make many wonderful memories on this property. Love that Hill Country…and that song! I found them! They are called “galley rods.” I searched “rods” before and they don’t come up. “Galley” was the key word. These are going to be great with my future open shelving! Awesome! I’m so excited for you and hope you love the look! Thank you so so much! I make my mood boards in Photoshop. I have the monthly Creative Cloud subscription, and I love it! You can see more on my photography resources page if you’re interested. 🙂 I hope this helps! 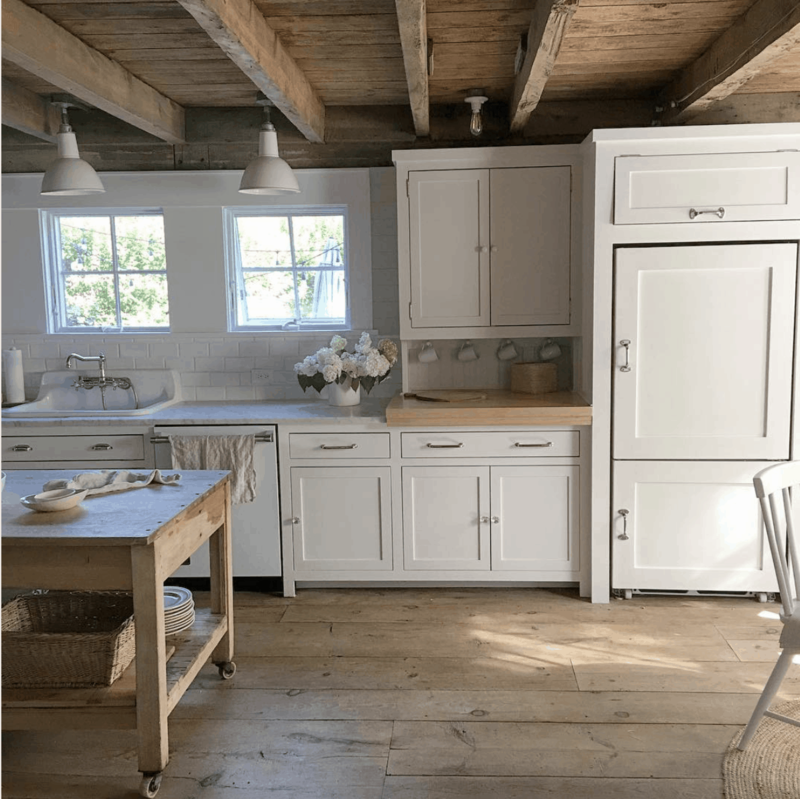 Love the makeover of these farmhouse kitchen! I am impressed with your work.Using light colors on the walls and the floor will also increase the feeling of space in your kitchen. So true! Paint is powerful at transforming a space. Home renovations are overwhelming at times. I just recently came across your blog, and as a fellow blogger I appreciate all the effort and energy you put into your posts! I love hearing from you and you totally inspired me! I can’t wait for your dream kitchen to come true. I’d love to connect more! I thought you showed this house before Christmas and you were decorating the front porch.. But that house had siding that you had painted a very dark gray or black. Same house?? ?